I love this time of year when I can almost see the growth of the plants in the garden. There also seems to be an abundance of flowers everywhere I look in the shops, on bedding, table linens, curtains, clothes and china to name a few. I decided now was the perfect time to capture some of my favourite wild flowers that grow here in England, cornflowers, corn cockles, buttercups, harebells, cow parsley and clover. These may not grow in other countries and if they do I suspect they have different common names, but I love their graceful simplicity which I have tried to capture, even though they are regarded by many as mere weeds….. Some images of flowers are not very accurate, others give a great deal of detail while others capture the overall effect. 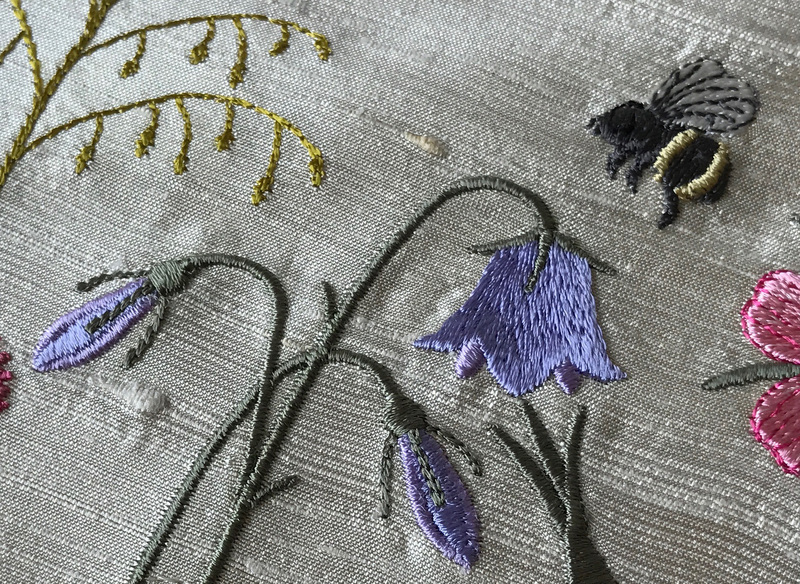 In digitising these flowers I have tried to make them look as natural as possible in stitch form, but confess that the insects that I have added to this new collection are not quite to scale. I started with the buttercups (ranunculus), those precious bright flowers which we used to hold under our chins to see if we liked butter! It took several attempts to make these petals look like the cups they are named after. When you stitch these out you will see I have used an entirely new method of stitching them. Next came the corn cockles, (agrostemma githago) outstandingly beautiful flowers, with deep pink veining which was a challenge. Forgive me that the veining is not as delicate and broken into tiny lines as the actual flowers. As blue flowers are less common, I have a soft spot for them all, and the intense colour of the cornflower (centaurea cyanus) is delightful. 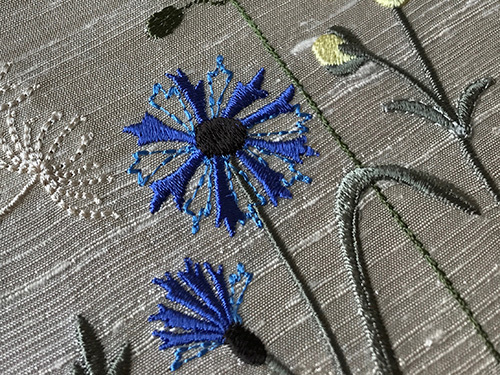 It would be impossible to embroider every petal so I have opted for a few petals and some outlines. Do make sure you use a vibrant thread for these flowers please. Another flower that I have always loved are the harebells (campanula rotundifolia) which I first remember seeing growing on the chalk downs around Winchester. These particular flowers appear to be so fragile but very graceful. 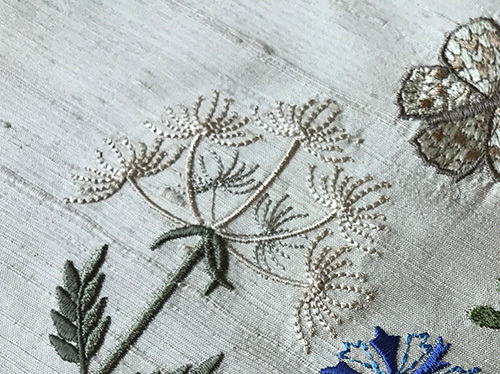 Cow parsley or Queen Anne’s lace (anthriscus sylvestris) has to be another favourite of mine, which I had promised myself I would digitise one day. When it grows in such profusion along the sides of country lanes in late spring it is almost impossible to believe it comes from the carrot family, displaying the beauty of lace! As the flowers are so small it is not possible to capture their beauty but the just the overall effect of these majestic plants. The last flower I digitised was clover (trifolium pratense) a ground loving plant with wonderfully decorated leaves. 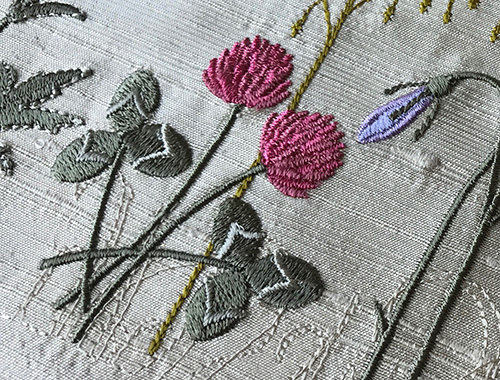 I have digitised these flowers in two pinks but you can easily stitch them out in just one, but the two shades add some dimension to the flowers. Behind these clovers you can see a ground silhouette which draws the flowers together when they are displayed in a row. 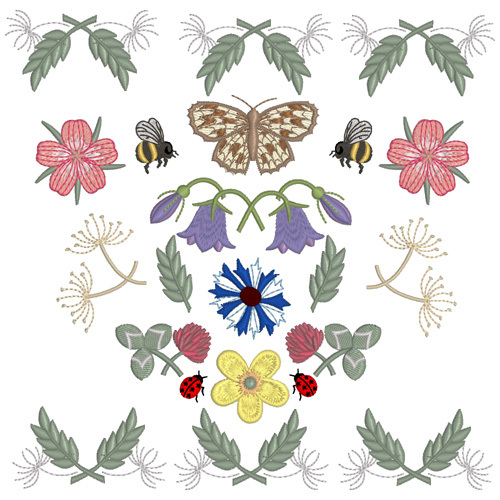 It will be available in the subsequent sets in the Summer Meadow collection. To give a realistic view of a summer meadow you will also find several grasses, a new bee design, a ladybird and this precious marbled white butterfly. As well as arranging your flowers in single rows you could also place them in several rows alternating them. After a great deal of experimentation I came up with some borders and a quilt block for larger hoops. The cow parsley leaves make a wonderful small border which I will be developing. The first set is now available, 30 designs for 4″ x 4″ hoops and there is also a freebie to test out. 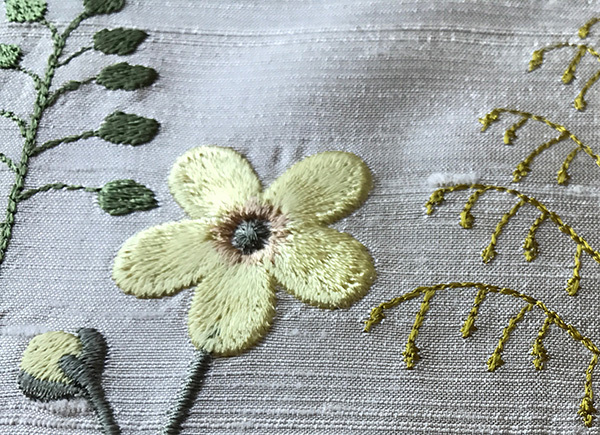 Enjoy these lovely designs and do share how your use these embroidery designs so I can place them on my website. 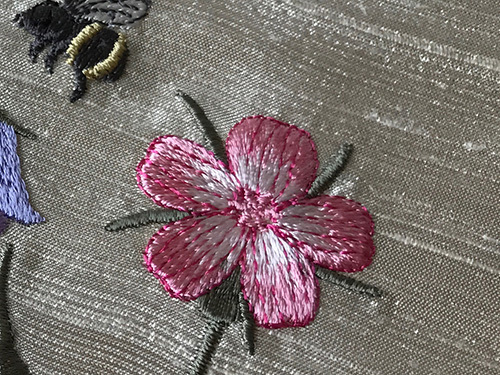 This entry was posted in Discussing machine embroidery, New Designs and tagged development of embroidery, Digitising flowers accurately, machine embroidery. Bookmark the permalink. Reminiscent of my youth hiking through the fields searching for wild berries! This design set captures, through accurate imageries, the hidden beauty in a country journey beyond the blacktop and concrete. Thank you so much for the new gift. Love the scent of clover especially in the evening when the fields are full and the dampness fills the air with the scent. I believe this may be my favorite set yet. Absolutely stunning! They are so delicate and beautiful. You are a very talented and devoted individual. 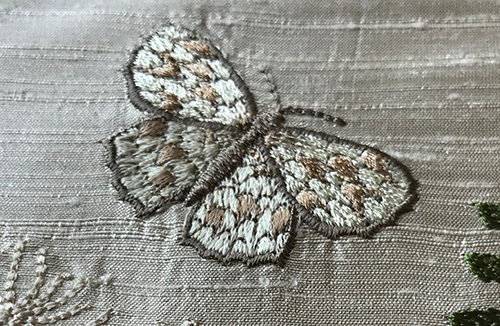 Every time I see a new design I want to stop what I am doing and go to my embroidery machine and loose myself in the my special world. Your designs capture the beauty of a flower so we can have them all year round. 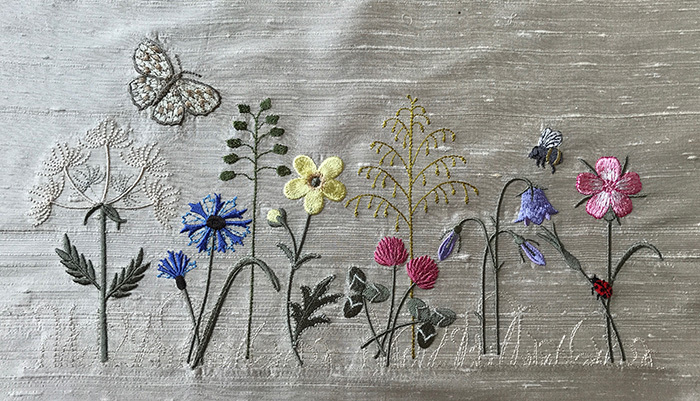 As a gardener I dread fall because it means the end of gardening out doors but then I have this world that you create in embroidery designs to go to when I can no longer garden out doors. Thank you for giving me the best escape in the winter months. It is March here but we had 27 inches of snow 2 weeks ago in Lockport, NY, so I am still embroidering in doors. This design is perfect for spring. Thank you.